I personally think Tsui Hark's contribution to the A Better Tomorrow-trilogy (the first two were directed by John Woo) is the second best of the movies. A Better Tomorrow II was, in part, sloppily made but had tremendous action which kind of made up for all that. A Better Tomorrow III is different compared to what John Woo did so that's why I think fans never embraced the movie like the first two. This movie was one of the first I ever bought from the Made In Hong Kong video label and to this date I feel this prequel is a well made and moving film. Tsui Hark and John Woo had by this time fallen out after successfully collaborating on a number of movies including The Killer (with Tsui as producer and John directing). Woo wanted the backstory of Mark (as done in this film) into the second movie, which would've made it a big sprawling epic. As producer, Hark disagreed and Woo went on to make his Vietnam movie Bullet In The Head while Hark did this prequel to A Better Tomorrow. Woo's film has nothing to do with the trilogy but the urine drinking story told by Mark in the first A Better Tomorrow was shot but never ended up in Woo's cut. It's now probably lost. Tsui Hark did get Chow Yun-Fat to once again star as Mark and with that also the freedom to take the series in his own direction. That the focus ended up being more on romance disappointed fans. Sure, there's action present but A Better Tomorrow III essentially is a three character love-drama that doesn't resemble anything Woo ever did despite the fairly similar themes. In this movie we get to see Mark receiving his famous coat, sun glasses and how he became trained by a woman, all adding to the story arc of A Better Tomorrow. Tsui Hark may not have shown the same strength as a director during the last few years but his work during the 80s and up to middle 90s is going to be highly regarded for a long time. Tsui Hark is going to be considered one of the best directors out of Hong Kong long after he's gone. When he's at his best he always infuses an epic sense in his movies, which of course is needed in the likes of Once Upon A Time In China but he has a great eye for visuals as well (Zu: Warriors From The Magic Mountain where the visuals almost borderlines on insanity). He can still tell a story despite having all that in his films so what we have here is almost a perfect director. Every director has his bad moments though which is so evident in The Master for example. Still I admire Tsui Hark greatly. In A Better Tomorrow III we see all that mentioned skill but the visual style takes a little bit of a backseat. It is more subtle but well after the movie has ended you'll remember many striking images from the film, most notable of Chow Yun-Fat towards the end with his double machine guns. Tsui Hark takes the script (penned by Leung Yiu Ming and Daai Foo Ho) and focus his attention on that instead. The theme is necessarily not about the Vietnam war or war for that matter but simply love and what one does to maintain or obtain that. Despite the jumps between Vietnam and Hong Kong, the director has full attention on the main characters and the love triangle that occurs at first. I thought that this triangle would run through the entire film but surprisingly it is soon over when the screenwriters let Mark and Kit fully embrace each other. That doesn't mean the end of the movie but now it's a story of how it and they will survive in this turbulent time in history. Tsui nicely fleshes out each important character and while clichés may be evident on paper, the execution is not that. I've seen this movie a number of times so I'm quite used to the pacing of it. Despite this edition's extended length, I was always engaged in the story and never felt the movie was particularly slow. It's much this movie goes through but the professionalism in director Hark makes this a smooth ride. There are some flaws in the narrative that I feel I have to point out though. After Mark and Mun have received their money to get out of Vietnam, we launch into a montage where the trio are now bonding like old friends. To me it just seemed that they became close just a little too fast but it's nothing the further development really suffers from. Later in the movie Kit's old lover and now gangsterboss (Tokito Saburo) enters and I honestly thought that things became a little uninteresting when he was introduced. He plays a crucial part from this point on but it just came off as the only boring part of the movie. I do have to stress that all that I've mentioned make it seems like the movie is executed perfect. It's not and despite well done aspects the movie 'only' reaches the strong 3 out of 5 (if I had to grade). 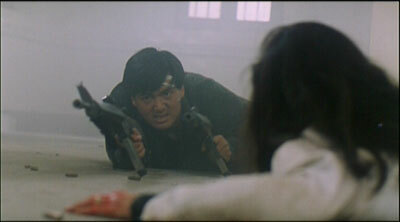 In terms of action, Hark's way of doing it differs quite from John Woo. We do get to see some large scale shoot-outs but I noticed that the director seemed to highlight the impact of individual death more than endless killing. There are moments when the camera stays longer on a fallen character (generic baddie or important character doesn't matter) and honestly I don't think Woo's way of doing it would've fitted this story. Tsui Hark also holds back when it comes to bloodshed pretty much all the way up to the finale where it seems fitting amidst the chaos. The impact and feeling is still there despite us rarely seeing blood spurting. The action finale continues out on the abandoned streets of Saigon which the movie could've done without in my opinion. It's certainly not boring or exciting but it seems to be there more for the action loving public than for the story. We previously had a closure to all things but again, it's eye candy. Another distraction in this finale comes in the form of a designated bad guy, the military character of Bong, but he serves no real purpose and what definitely not needed. Those are misses in the final section of the film but somehow it doesn't affect the overall emotional feeling after the movie ends. These action scenes and the drama is enhanced so much more thanks to Lowell Lo's rousing score (composer of An Autumn's Tale). It's a big score suitable for a movie like this and while it plays on our emotions, it wouldn't have worked if we didn't feel the emotions from the events on screen. We care and the music benefits and makes us care even more. 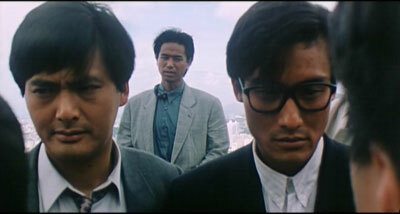 Horace Wong's photography must also be mentioned and he went on to shoot John Woo's Bullet In The Head after this. 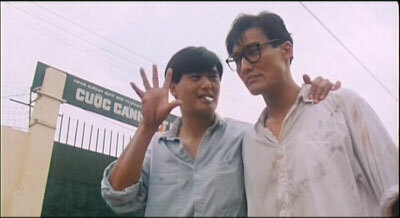 The main trio of actors do good work as well and leading man Chow Yun-Fat is responsible for providing us with the image of Mark when he wasn't a gun-toting gangster. Chow is as always very charismatic but since he isn't yet the Mark from A Better Tomorrow, his romantic side is more evident at this time. The character arc is competently written and performed and it gives us some nice background to Mark. Nothing award winning but he makes sure the performance becomes a part of the trilogy. Anita Mui was a surprise as the woman behind Mark so to say. In a really effective way she acts out the cold and tough Kit in combination with the tender side of her character. She has been involved with criminal activity for so long that she's never been able to let her feelings, for someone, breath until Mark comes along. It feels like a side of her that she's never seen. Anita looks so beautiful and is really part of what makes this movie touching at times. Tony Leung Kar-Fai's character could've become annoying in another actor's hands but the, at first, naive Mun is handled nicely by Tony. He grows after he realizes what is best for Kit and Mark and really takes responsibility in his part of the unfolding events. Also worth mentioning is Sek Kin (Mr. Han from Enter The Dragon) who has a memorable part as Mun's father. There are those who love Tsui Hark's Peking Opera Blues which I wasn't as fond of. In my opinion A Better Tomorrow III is better and most importantly an underrated film. One can't help to think how it would've been received if it wasn't part of the A Better Tomorrow-trilogy. The WA dvd houses the longer 130 minute Taiwan edit of Tsui Hark's A Better Tomorrow III. As far as I could appreciate, this version runs about 10 minutes longer with new footage mainly in the middle part of the film. I enjoyed seeing most of this since it emphasized the romance and motivations for it a bit more. Certain other motivations for violence are also slightly fleshed out and all in all, no scene really felt like it slowed down the film. While it's a shame that many good scenes didn't end up in the Hong Kong print, I can understand that the running time needed some shortening. The reason it's longer in Taiwan is that at the time it functioned (and to some extent I think it still does) as a testing ground for the filmmakers. They see what doesn't work and needs to be taken out that way. Lucky Taiwan audience!. Sadly not a whole lot of movies with longer Taiwan prints are on dvd but thankfully this is. I've done stills of the added and extended scenes into something I like to call the A Better Tomorrow III Deleted & Extended Scenes Gallery. It's not currently known whether Hong Kong Legends will put these scenes on their upcoming dvd but regardless it's nice to have them edited into the flow of the movie. You should also check out this link to muldoon's (of Asian DVD Guide) remarks about the longer edit. The 1.85:1 transfer looks pretty solid throughout. There are speckles and sadly some very visible lines through the print though. Night scenes suffers the most though but the print boasts nice colours. As far as I could see, every new scene and extension had a marking at the beginning and end of it so it's fairly easy to see what's new. Some may be distracted by the marks but they don't last for more than a second. There is only a Mandarin Dolby Digital 5.1 track on the disc and as with every other WA release there is a horrible echo present. It basically sounds like it's been taped inside a large theatre. This is mostly distracting during dialogue but truth be told I kind of forgot about it as I was sucked into the movie. The echo sometimes leaks into the surrounds but the sound stays pretty much centered throughout otherwise. The optional English subtitles contains some small errors but were better than I expected. I have to give credit to WA for translating the Anita Mui ballad also. A set of Chinese subtitles is also included but I don't know whether they're simplified or traditional since the disc's menu is all in Chinese. In that menu we only find options to play movie, select a scene or select subtitles.